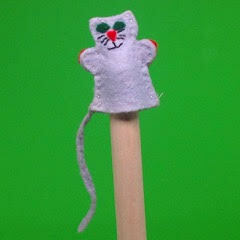 As Team Puppet-A-Go-Go has been producing finger puppet after finger puppet over the past six months, I’ve noticed how much I enjoy adding facial features to the finger puppets and what a difference it makes. Whether the puppet is a cactus, a bullrush, a woman or a 1960s starfish, once eyes and mouth are added, the puppet seems to come to life and take on a personality of its own! 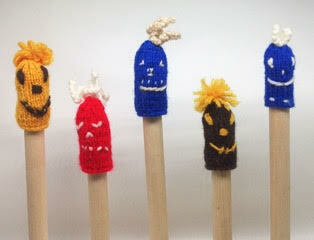 When I told my mom-in-law about 1000 Finger Puppets, she immediately sent her puppets in the mail to inspire me. Now she’s asked for them back (there are some grand-kids to entertain over the winter months). I will miss these friendly and wacky characters! Lilian’s collection of charming puppets from her days as pre-school teacher and hospital volunteer offer a range of techniques and designs. 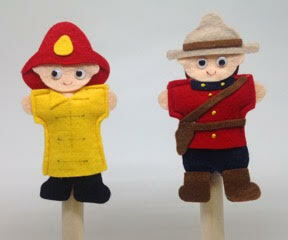 Puppets, not unlike animation, have gone hand in hand with children’s programming since its inception, no doubt due to the limitless possibilities of the medium and its power to capture the imagination of young minds. While puppet narrative interludes or significant puppet characters (i.e Casey & Finnegan on Mr Dressup) became the norm for kid’s tv, the format remained fairly conventional in its approach. Of course, the advent of Sesame Street and Jim Henson’s other (and dare I say better) offering, The Muppet Show, would change the nature of children’s programming and popular conception of puppets indelibly. Larger puppets, humans as secondary characters and the populist notion of a program for children that adults could also enjoy were the cornerstones of what made Henson’s work so revolutionary. Before I veer too far off into discussion of whether or not this archly camp wonderland was intended for the enjoyment of children or adults high on drugs (or frankly both) I want to get back to the meat and potatoes of what interest and inspires me about the show in relation to this project. Which, actually, is the meat and potatoes. They, like practically everything else in the Playhouse, are anthropomorphized and can be seen dancing around the fridge in any given episode of the show. Not content to simply have a usual array of puppet characters, the Playhouse is literally alive with puppets that not only are characters but sometimes also a functional piece of furniture or the building. Pee-Wee often goes to check in at “PuppetLand” the charming grotto nook where his beatnik jazz band are playing (obviously a reference to “Birdland”, the famous jazz bar) but the entire Playhouse fits that description, with its talking clocks, globes, chairs and windows. And why not? If the imagination can allow for conversing with a giant yellow bird or his elusive doe eyed Wooly–Mammoth-minus-the-tusks-type creature that is his friend, why can’t we concede to getting a weather update from the kite flying outside? 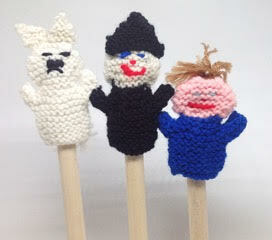 It is with this spirit in mind that I am creating some of my puppets for this upcoming show. My list of possibilities grows daily and is boundless in its limitations (and always subject to veto) from “Molly Ringwald” to “Bahn Mi”, thanks to my misspent teenage years watching Pee-Wee’s Playhouse which taught me that a chair might not just be a thing to sit on and that when you do, it might tickle you. 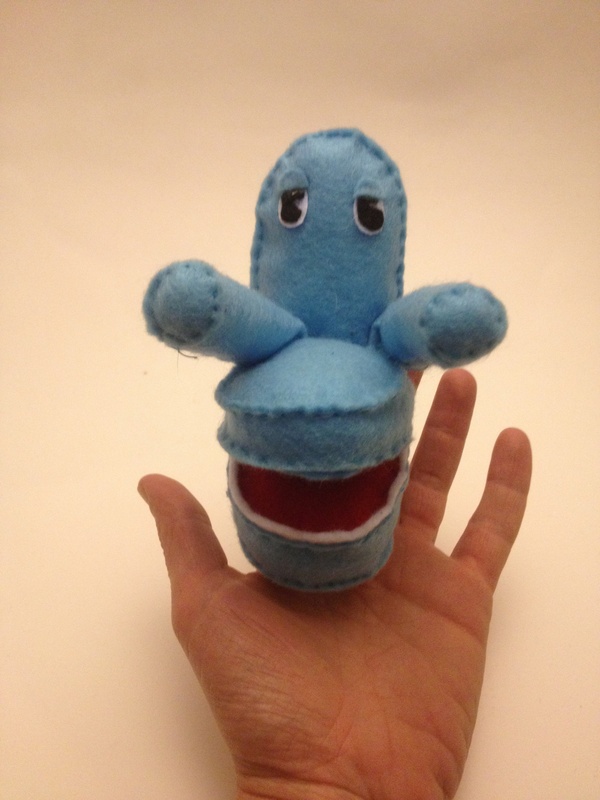 And with that very thought in mind I leave you with my tribute— Chairry as a finger puppet. And Now, Merry Day of the Dead! We’re fans of Halloween, but Day of the Dead is also pretty great! 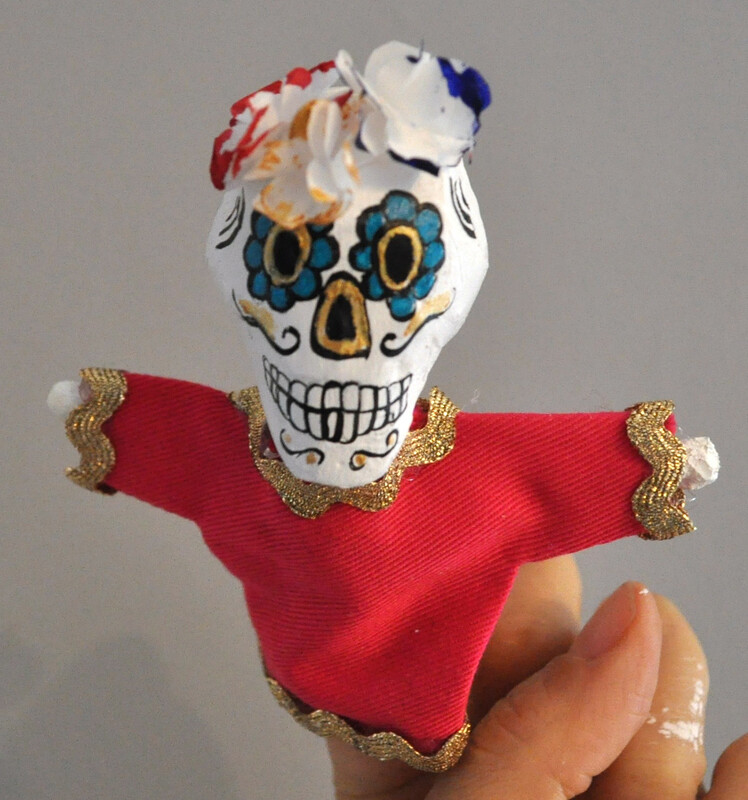 Want to make a skeleton puppet (or any puppet) for our wall of 1000 finger puppets? Details here.